It wasn't a joyful occasion when Sigmund Reiser, his wife and his two-year-old son arrived in Canada in 1946. Reiser, a Jew from Poland, was the sole survivor of his family. The Nazis killed 21 other members. Canada was the only country that opened its arms to him. "This is the story I tell people: 'Look at me, I'm no different from you. If you have the determination, you will accomplish things,'" says Reiser. "I just wanted to get out. 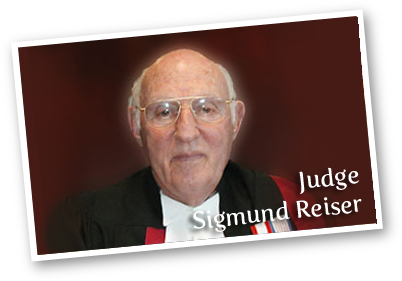 Europe was a graveyard to me," says Reiser, now 79 and a respected citizenship judge in Scarborough, Ontario. Soon after landing in Montreal, the Reiser family went to the train station. They were heading to Winnipeg where his wife's mother was living. In the station, two women came up to him and asked if his son needed something to eat. Reiser couldn't speak English. The pair tried to give him $10 but he didn't know where to shop. The women, "volunteers of some kind," says Reiser, bought food for the family and gave him the change. Reiser says he's never looked back since arriving in Canada in 1946. When he first got to Winnipeg, he spent a few weeks looking desperately for a job and got one at a factory. He was laid off two weeks later. But he found another job and another one, each time with better pay. At the factories, he worked from eight in the morning to eight at night. "I'd splash some water on my face and study English at night." After three years, he got a job as an insurance salesman at London Life. "In the first year, I made $15,000, which was a fortune at the time," recalls Reiser. "I was also the first salesman to sell $1 million because I worked hard. I worked weekends; I worked all the time. I lost 27 years of my life and I wanted to make it up." He was quickly promoted and rose in the ranks to become London Life's regional manager in Toronto until he retired nine years ago. His story has been re-told to countless new citizens at the citizenship ceremony, the last official step in an immigrant's journey to becoming Canadian. When a person applies for citizenship, their form, along with the fee payment, goes to Sydney, Nova Scotia to be processed. Afterwards, it is forwarded to the area office where the person lives. The applicant is also sent a book – A Look At Canada – to study. As citizenship judge, Reiser reviews about 30,000 applications a year. He makes sure the applicant has fulfilled the residency requirement, then sets a date for the examination. The test is held at the federal offices of the citizenship department. Applicants are given a multiple choice and short answer quiz. The questions cover everything from geography to history to politics. The pass mark is 12 out of 20. There are four mandatory questions. Applicants must get three out of the four questions correct. People who fail the test are directed to Reiser for an interview. The discussion can last from 15 to 45 minutes, depending on the situation. If it's a matter of asking some similar test questions, the process is quick but sometimes Reiser needs to test a person's ability to communicate in English. He holds between 12 to 20 interviews a day. "If they can converse with me, more or less – and they don't have to be grammatically perfect – I will pass them. I just need to know if they understand me or if they understand what they're talking about." Sometimes, applicants are physically or medically unable to write a test. Reiser has been known to visit people in their homes. He once went to the home of a Chinese woman who had cancer and administered the test. She wanted to become a Canadian citizen before she died. Once they've passed the requirements, the successful applicants must attend a citizenship ceremony. Reiser presides over the ceremony at which applicants take an oath, receive citizenship certificates and sing O Canada. "It's such a good feeling. They're all happy and smiling because they're getting their citizenship." In every ceremony, Reiser prepares a speech and talks about Canadian values. "Our values flow from this: the respect for the dignity of human life," he points out. "Values of equality and acceptance, fairness and justice, compassion and decency, tolerance and inclusion. They all emanate from that one principle." At a July 2002 ceremony in Scarborough, the room went quiet as Reiser told 105 new citizens that they belonged to Canada and would be treated as equal to anyone under the law. The Scarborough citizenship office is the busiest in Canada, swearing in about 32,000 immigrants a year. Presiding over the ceremonies has given Reiser something he never had when he received his citizenship papers in 1953. "I came to a judge, he mumbled something and he wasn't even looking at me. He signed a paper and gave it to me and that was it." And because he himself didn't have the ceremony, Reiser believes all Canadians should have the experience. Reiser has agreements with the York Board of Education to hold citizenship ceremonies at their schools. He has gone to about 80 schools in the past three years, returning to some of them for the third time. "We bring in about 30 applicants and hold the ceremony there. I make a speech about being Canadian. Children are so impressionable. They love seeing a judge and all the pomp and ceremony," says Reiser. He also sits down for a question and answer session with the students after it's all done. "This is the most satisfying, because we leave the students with something to remember about being Canadian." The proof is in the stacks and stacks of letters he has received from children, teachers and others, commending him for his public ceremonies. Reiser also holds ceremonies in libraries, at cultural fairs and at legion halls. On July 1, 2000 he presided over what he calls the biggest citizenship ceremony ever in Canada. Two thousand applicants were sworn in, with another 4,000 people looking on at Downsview Park in northern Toronto. Another memorable ceremony involved the police academy. Reiser arranged for it to take place after the graduation of police rookies. He got the rookies to swear the oath as well. "Some people are scared of our police because where they come from, the police are oppressive. I want them to realize police are here to defend us. I thought it would create some trust." Despite his busy schedule, six grandchildren and two great-grandchildren, Reiser says he doesn't intend to give up his position any time soon. "I am not a golfer or a card player. I think this is the best hobby I can have," Reiser says. "Here, I know I am doing something useful for Canada...which is more than I can say for golfing."